If you gave me a dollar for every croissant I ate in Paris, you still wouldn't be able to match me in Euros, because Paris is EXPENSIVE. I really don't remember it being that expensive on my last two trips, which makes me question if I was just so in wonderment the first two times, which is how I didn't notice, or if the prices really have gotten higher in the last two years. Either way, my three days in Paris were delightful. I was so ecstatic to be back, in what I consider to be the most beautiful city in the world. My lovely boyfriend and I got on a late bus from Victoria Coach Station at 10pm on Friday and started off into the night on our way to Paris. What I will say about the Megabus is that in the future I will not be taking it, and not because it was horrible, but mostly because it takes the ferry across the English Channel to get from Dover to Calais, and I cannot handle how much the boat rocks without getting a horrible headache. But the 10 hour bus ride was worth it once we arrived into Paris the next day. Our first stop was The Louvre, which we wandered around for a few hours. The last time I was there was three years ago, and nothing had changed, so it was all a bit of a reminiscing experience for me. Levi didn't like it as much as I thought he would. He's more a fan of modern art, so we left before planned and headed to the Pont Des Arts Bridge, which is right by The Louvre. I finally got to fulfill a bucket list item of mine by putting a love lock on the bridge with my boyfriend, and then throw the key into the water. I'm glad we actually got to do it though, because they're cutting off all the locks and replacing the grids with plastic covers so people won't be able to do it anymore. We got there just before the full change. We ate dinner at the cafe from the film Amelie, then went and found our home for three nights. Our host was there to greet us with a key and wifi password. We set our stuff down in our very cute flat, took a nap, went out to explore the area some more, and then went to bed after treating ourselves to some champagne, baguette and cheese. The next morning, we made our way back to the Eiffel Tower, and sadly it was raining very hard, which meant the line to go up was shorter, but it was freezing and wet at the top. 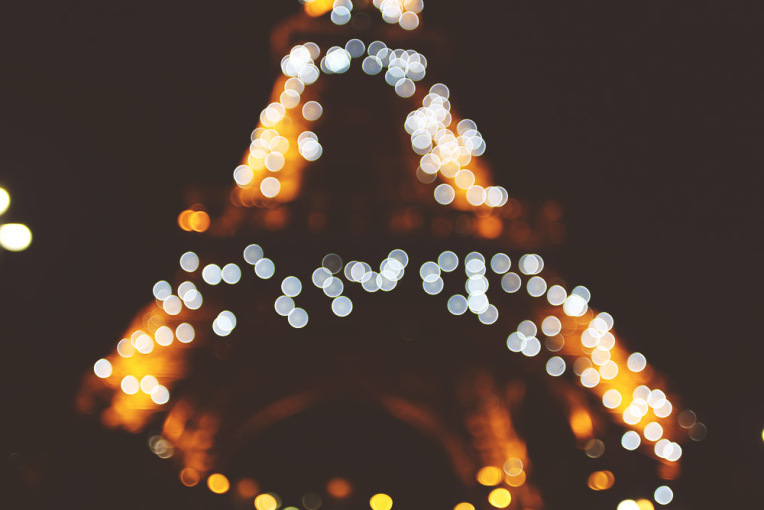 I am a huge fan of the Eiffel Tower, even if some people dislike it. It's a gorgeous structure as well as gives you a 360-degree view of Paris. I was starving after we left the Eiffel Tower, so I got some churros (or Chi Chis as they were called in Paris), and they were the best thing I've had in awhile. I hope it wasn't just because I was so hungry. While leaving, Levi and I had to dodge so many of the people selling Eiffel Tower toy replicas. These people are seriously what ruins Paris for me. Levi made a funny observation though. He saw them as non-playable characters (NPCs) that you'd encounter in a video game, and the creator made a glitch where that sprite is duplicated a hundred times, every 10 feet or so. With that in mind, I tried to think of it that way, but it's still frustrating when you're trying to enjoy a city when there are people coming up to you with champagne, toys, or something you don't want to buy and shoving it in your face. On our final day in the city, we walked along the Seine River towards Notre Dame, went to the famous Shakespeare & Company bookstore, browsed the stalls along the banks, and enjoyed how sunny it was. We ended our day with a long walk up the stairs to Montmartre. We walked around this area, watched the sunset from the steps of the Sacre Coeur, went inside for a moment to hear some haunting music from the nuns, and ate bread and cheese. I was so happy to finally have my romantic journey to Paris that I've always wanted. I wanted to see the Eiffel Tower light up, so we took one last Metro ride to watch the structure sparkle. It was the perfect ending to one of the best days of my life. Paris may have its flaws, but I think the beauty of the city overcomes that and that's why you can ignore how expensive it is, or the annoying salesmen, or the overwhelming smell of pee and truly enjoy the city for its sights. I love it here so much that I'm considering coming back here to live for the summer so I can learn French and work on my writing and photography. It's an enchanting place, which I'd like to spend as much time in as possible. The next morning, Levi left early to take a train to Barcelona. I slept in a bit and then went to my train back to London. I decided to take the Eurostar back, because it takes less than two and a half hours, and it may cost a bit more, but it's fast and comfortable. Amazingly enough, the man I was sitting next to on the train, happened to be a celebrity publicist, which is my dream job, so I got to sit with him and pick his brain for the entire journey. He has many famous clients and I couldn't believe my luck to get to speak with someone who has the job I want to have. It was basically fate, and gave me that boost of encouragement I needed to continue on that career path. I arrived back in London, and for the first time, it felt like home. I hadn't felt that yet, so it was a positive thing to know that London is finally where I feel that I live.